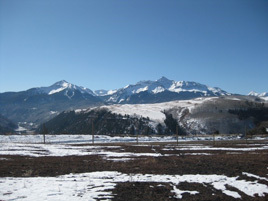 Boasting the highest North American elevation for a commercial airport, the Telluride Airport (EL. 9,070 feet mean sea level) poses unique considerations when it comes to engineering design. As a more than 20-year Terracon client, Telluride Airport’s projects have ranged from geotechnical and materials services for runway reconstruction, safety area improvements, to geo-design services for landslide mitigation. 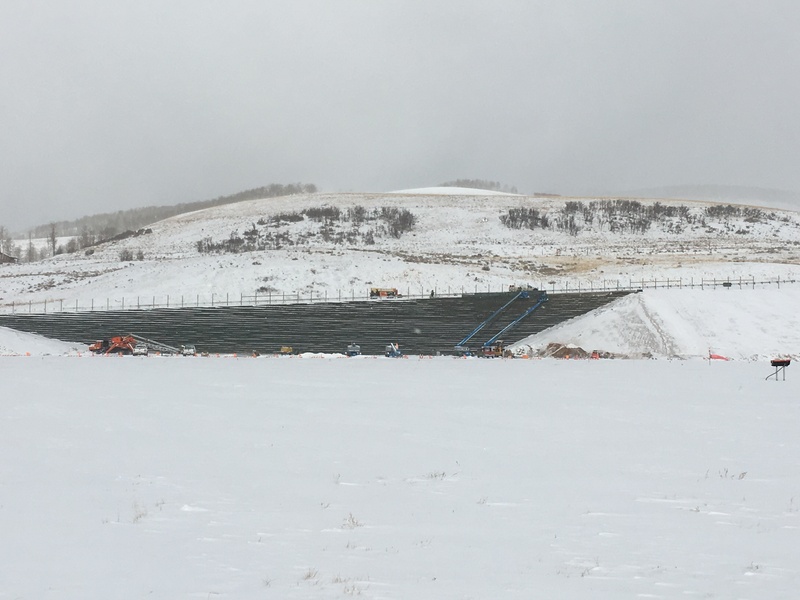 Our most recent project collaboration with the airport was the design and construction of a de-icing pad adjacent to Taxiway A, considered a necessity for airplanes taking off at this high elevation. The de-icing pad was planned at a location between the airport access road and Taxiway A. Due to the constraints of the slope from the road to the runway, a significant excavation was required of the existing hillside to achieve the final grade of the pad. To secure the hillside, our team evaluated several types of potential retaining wall systems, while working in concert with Kimley-Horn and Associates (KHA), who provided the project’s civil design. To cause the least disturbance to the existing roadway, a top-down construction approach utilizing soil nails was selected. Soil nailing is an earth retention technique that uses grouted tension-resisting steel elements (nails) that can be designed for permanent or temporary support. This process allowed the continued use of the airport access road and considerably reduced excavation requirements and construction costs. Terracon designed the soil nail retaining wall and provided the plans and specifications for construction. During the building process, our team provided the Federal Aviation Administration (FAA) quality assurance testing and special inspection of the retaining wall and all aspects of the de-icing pad. Having quality assurance conducted by the same team that designed the wall and de-icing pad proved to be important, as there was less chance of something not being installed correctly. An important design element was the airport authority’s request for a wall that would look natural and blend in with the surrounding landscape. Given the location of the project, there was concern that the more than 40-foot-tall retaining wall would be quite noticeable to residents in Mountain Village located south of the airport property. Terracon has previously designed projects with vegetated facing on retaining walls, including landslide mitigation at Telluride. The team recommended this proven approach to the airport authority and KHA. To support the vegetated facing, Terracon selected welded wire basket facing attached to a temporary shotcrete soil nail wall. The design included a partial wire basket infill of topsoil seeded with a special blend of high altitude grasses selected especially for the site. In general, welded wire basket facing is not utilized on any consistent basis as a final soil nail retaining wall facing. However, given the altitude and climate, Terracon designed a specialty wire basket to suit the project’s particular needs and allow for vegetation growth with a unique connection to the temporary shotcrete facing. Construction of the retaining wall was completed in eight months with vegetation growth expected the following spring. This project offered a unique opportunity for the Terracon team to devise client solutions that met both the engineering design needs and provided a stable retaining wall to support the excavation above the de-icing pad. By offering FAA quality assurance for materials testing and inspection, Terracon provided assurance that not only would the project be completed properly but would stand the test of time. Brittany Dalton, E.I.T., is a staff geotechnical engineer in the Phoenix office. She has experience designing various types of retaining wall systems, including Mechanically Stabilized Earth (MSE) retaining walls, gravity retaining walls, soil nail retaining walls, and temporary shoring. Brittany has been involved in reinforcing soil slope designs and conducting global stability analysis of unreinforced slopes. She has also performed pavement inspections and geotechnical field exploration involving classifying soils and obtaining soil samples.